Henry Bell & Co (Grantham) Limited has been established since 1825 primarily within the agricultural industry supplying seed, fertiliser and chemicals to local farmers and trading their cereals and pulses. As a natural progression three micronizers were installed in the early 1980’s to utilise the expertise gained within the cereals and pulses trade resulting in the company becoming one of the major suppliers of flaked cereals and pulses to the animal and pet food industry. 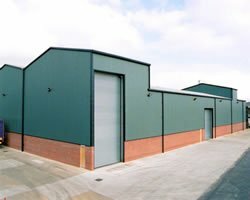 In 1998 the installation of a fully computerised mixing plant with a second line in 2003 gave us the flexibility and capacity to mix for a very wide and varied customer base within the wild bird and small animal industry. With over 20 years experience in the dried pet and bird food industry we have gained the expertise and knowledge to formulate and develop our customer’s bespoke requirements and then pack under their own label in a wide range of bag sizes from 500gm to 25kgs. As a large importer and end user of seeds like black sunflower, sunflower hearts, Niger, striped sunflower, safflower etc we also source and supply these seeds for other manufactures in either bulk or bags. Read more about Henry Bell in this article.